Many people asked me to review my Fitbit Flex, so I figured it was perfect timing since Livi is napping and the house is ready for tonight’s little fiesta. Just a head’s up: I paid for the Flex with my own $, and am not affiliated with the company in any way. Fitness trackers are really glorified pedometers. They provide a variety of insightful data through their respective apps -I was most curious about my sleep patterns- and track movement help you to gauge your activity level throughout the day. I really love the design of the Jawbone Up, but had read online that quite a few people had issues with the quality and the customer service when their Up bit the dust. I also thought the fact that you actually have to plug it into your phone to sync was a bit of a hinderance and figured I’d prefer something with Bluetooth capabilities. That left me with the Force and the Flex, and I ended up going with the Flex. The tracker can be removed from the wristband, which is great because rubber wristbands tend to get gnarly after a bit of use, and it was smaller than the Force. Fitbit One is another option, which clips onto your clothes (more like a traditional pedometer) but considering my propensity to lose things, it wasn’t really an option. Flex it was! It arrived the NEXT DAY (wahoo for Prime shipping!) and I couldn’t wait to test it out. Now that I’ve had it for a few days, I thought I’d share some of my pros and cons. -It tracks approximate mileage, steps, calories burned and sleep patterns for the day. If you’re a MyFitnessPal member, you can sync it with that app to track your food intake, too. -I LOVE THE SILENT ALARM. For the silent alarm, the wristband vibrates a few times to wake you up. It’s amazing, and not as harsh as my angry iPhone alarm. -It’s pretty inconspicuous. A few people have asked me about it, but I don’t feel super nerded out wearing it. Of course, I’d never wear it with a pretty dress, but for every day, it works. -Easy to use and easy to set up. With the app, it pretty much runs itself. All I have to do is tap it twice to see how I’m doing -lights indicate whether you’ve reached your goal- or to tell it I’m going to sleep. -Comfortable snug wristband. Each pack comes with a large and small wristband, which is extremely comfortable and secure. I haven’t had it fall off or anything like that. -While I like the fact that you can remove the tracker from the wristband, the thought of getting water in there skeeves me out. It says you can wear it while showering or swimming, but I’d be afraid to. -It’s still kind of ugly. I think this is why the Jawbone has major appeal, and I’m excited to see some of the sleeker fitness trackers that will hit the market this year. How accurate do I think it is? While I think it’s less accurate than a heart rate monitor, for everyday, I think it makes more sense to wear a tracker and get a general idea of trends and patterns. You can always gauge improvement, whether the numbers are perfectly precise or not. I realized that it counts my crazy hand gestures as steps, but doesn’t count for much when I’m strength training, so it must balance out. I especially love the sleep tracker. For the past few months, I’ve woken up feeling totally exhausted. I had blood work done because I thought something was wrong with me. Turns out, I’d been sleeping horribly. The first night I was restless 22 times! I don’t know if it’s a subconscious thing or what, but the past few nights I’ve been restless ONCE and have woken up feeling amazing. It’s HARD to get in the recommended 10,000 steps per day. I’m a pretty active person, but on the days I don’t run, it’s challenging to reach that number, especially because Tucson isn’t a walking-friendly city. It’s very spread out, and you have to drive everywhere. Even with constant active play with Livi, in order to get to my 10,000 steps, I have to take Bella for a nice long walk and get in some kind of cardio for the day. Do you have a fitness tracker or another method to gauge your activity level? Fellow Fitbit friends, any pros or cons you noticed that I haven’t listed above? Have a great night and I’ll see ya in the morning! I have been using my flex for the past couple of months and I use it in the pool . I swim twice a week and have not had any issues so far . I got my flex a month ago and absolutely love it. It gives me a pretty good idea of how good or not so good I’m doing that day. I also love the sleep tracker. Since having my youngest daughter I have not gotten a whole lot of rest and the tracker really let me know that I am sleeping horribly which is why I have been feeling awful and relying on my coffee to get me through. Im on the verge of becoming a caw-fee addict…seriously. 3-4 hours a day is what i have been averaging for the past month and pretty much two years..with interruption. Thanks to to fit bit, I’m now totally aware of how bad this is…I have to say that I think I like the food log on my fitness pal better. My fitness pal seems to have more loaded for calorie count and the scan the box option is awesome too! I’ve been thinking about picking one of these up too. Great review, thanks! Thank you so much for sharing this! Can’t wait!! So I am not all that crazy about the very limited Tory Burch FitBit line, and also think its a little too expensive. I got a great bracelet from FUNKtionalWearables.com that totally hides my FitBit, I wear it almost every day, it is simple and silver it goes with everything, plus it only cost about $40. I got a fitbit flex a few months back. I’m glad that even you find it hard to get in the 10,000 steps! I thought I struggled because I work at a desk all day and I was getting really frustrated. lol. I love how it keeps me aware though! I don’t like the food logging… I used to use Noom, and this is just a horrible food database in comparison. (Will someone please tell me what a gram of mashed potatoes looks like?!) So often I end up ‘adding’ a food and just putting in the calories off the label because it’s actually easier to start from scratch. Since I’m no ultra-athlete, it’s good enough as a trend of how active I am day to day. It really does cause me to walk the long way to the printer! And I love – make that LOVE LOVE LOVE – the alarm. I thought it might not wake me up, and had my regular alarm set as a backup the first night. But it totally wakes me, and in such a better way than a blaring alarm. And I don’t wake up every 5 minutes to check the time on those mornings I end up with a kid in bed with me, because I don’t have to worry that my alarm going off will wake them! Love. have you ever tried “myfitnesspal” for food tracking? It connects to fitbit as well. Just a thought. I use it and love it. You can add your own recipes and the database is pretty all encompassing. 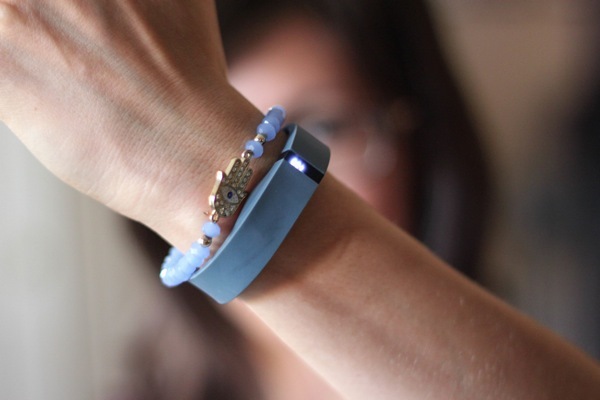 I have the Fitbit Flex and know what you mean about it being a little unattractive. I take the tracking chip out of the wrist band and put it in my bra when I’m at work and it tracks perfectly from there. I have been doing this for a couple of months with no issues, you just need to remember when you take your bra off! awesome tip- i’ll try that! So glad to hear that someone slips the tracking chip in their bra. I’ve been thinking about doing that but was afraid it would stop working. I don’t think it’s ugly . . . and it looks like it would fit a small wrist comfortably – I can never buy anything for my wrist that isn’t adjustable – and even some things that are adjustable are too big – that would be my only concern. I would like it to be snug and not spin around. Thanks for taking the time to share your review – very helpful! I have a small wrist as well, 5 1/2″, but don’t worry, it fits. The starter kit does come with a small wrist band and i think you will find, like i have, that it fits perfect and doesn’t spin. The way the “bit” fits into the band, it doesn’t really allow for spinning. I love fitness trackers, and bought the Jawbone UP last February…before all the reviews starting coming out. I’ve had to replace it 3 times already (the company has been great about doing the exchanges for free), but I think in the future, I’ll go with something else until things get improved a little more. I got mine for Christmas and was just loving it, I logged all my food Dailey for the last two weeks, had it set to lose weight slowly. Each day fitbit app telling me how many calories I have left..doing great…then I weighed in this AM to find out I gained two pounds! Checked the app site to find out all the calorie numbers CHANGED to show I went over each day. I am not sure what happened, but I am thinking along the lines that somehow it lost connection to the app. Can anyone throw some light on my issue. I love the idea but it has to be accurate. I have the FitBit Zip, which is super tiny (http://tinyurl.com/obo3859) and hooks onto your bra. It’s cheaper and doesn’t record sleep, but I’ve found it pretty accurate and it, too, uses Bluetooth to the phone app. I love it! It’s about $50 so a nice option for a little less moola. 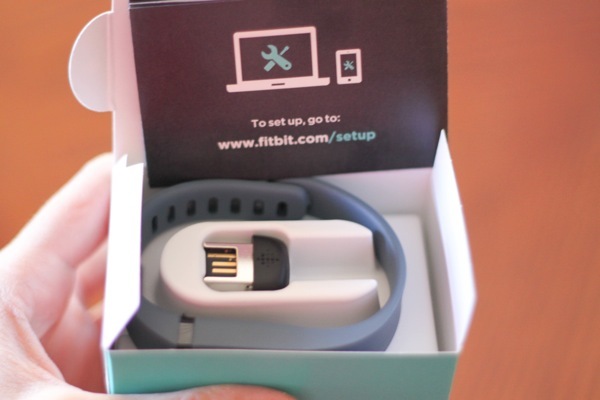 I would really like to try these fitbit products. I just haveone question , whether the zip will accurately measure the calories burned while doing zumba classes or spinning? I am so glad you covered this, because I have been thinking about getting one! One question, when it tells you about how many calories you have burned…do you try to eat within that range? I am a stay at home mom of two toddlers and one on the way and I exercise several times a week. I never know if I am eating enough or too much (sounds crazy, but some days I am exhausted and wonder if I have adequately refueled). I don’t know how to gauge how much to eat, etc. With another baby coming and the thought of breastfeeding, chasing 3 kids, and still trying to possibly make the bikini happen this summer, I am wondering if this would be a helpful tool. Any insight? i tend to naturally eat around 2000 calories, give or take. when i was teaching a ton, it was more like 3000. I love my fitbit, which my husband gave me for Christmas. I love checking in to the dashboard periodically and seeing those big smiles at the end of the day! The most important benefit for me has just but been that it keeps me mindful and encourages me to take the stairs, walk instead of drive for short trips, etc. Of course you could save yourself the $100 bucks and just do that anyway… But I love it still 🙂 It is is hideous, for sure, but it being winter in Seattle it’s almost always covered by my sleeves anyway. SO excited to hear about Tory Burch though! I just bought one after your review :). I just started using it today and am already obsessed!! Which hand do you wear it on and do you set it as dominant or non-dominant? I am curious about sensitivity and can’t really find much info. Here is the pdf of the owners manual. I got it off of kogan.com.au. Have you worn it while running? Is it accurate for mileage and calorie count? I had the flex for awhile and then recently upgrades to the force, which shows all your info on your band so you don’t need to keep checking your phone/computer. I just wanted to add really quick, since I LOVE my fitbit, that mine was off too but then I adjusted my stride length on the website. It made a big difference and is now much more accurate. I wasn’t sure if you had already done this or not, but thought i would mention it just in case. Love your site! ohhh, i’ll try that- thank you! Thanks so much for your review! I have been wanting one for a while now and after your review put one in my amazon cart then told my husband that’s what I wanted for my birthday. He wasn’t too sure so it waited a few days and decided I was going to buy it today, it had dropped $14 bucks! Glad I waited. Can’t wait to start using it. We went to one car and are moving on base so I’ll be walking a lot! so awesome! let me know what you think! 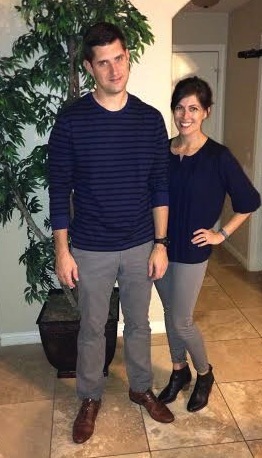 Glad you guys all love your fitbits – my wife and I love ours as well. So much so that I set up a motivational site for fitbit users – trouble is getting people to join up and try it out. Where do you guys think we could reach other fitibit users like yourselves? Has anyone tried wearing the Flex on their ankle? (Does it fit? How comfortably or not so much?) And if so, have you noticed any particular differences? Check out my review too! I have contemplated the titbit for a while. 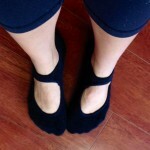 When I first looked at them, my husband thought it was below my level of fitness (meaning I was exercising and tracking and doing great why bother). Since then I have had a few set back and I am struggling to get back into the groove. I am seriously a numbers girl, love tracking my runs with eh Nike app, so I think I am going to look at it again. Thank you for your thoughtful review of the product! I love my Fitbit. I got it just after Christmas and have had no problems, even shower with it ( but take it off before the sauna). It is a great motivator for me to get out in the frigid winter weather to walk my Lab. It also motivates me as my daughter and Ex are friends and it shares our goal info. So far I’m kicking their butts It’s great for monitoring food intake also some generic foods are missing but it has many specific foods, like Medifast items. I’ve lost 15 lb since end of December. However, I don’t feel as it is as accurate as I would like. If I enter a walking activity, it seems to double counts my steps and miles (which may account for the 22000 steps and 10.2 miles I had one day). I think the calories may be too high also. I have the Flex but would like the Force since I do a lot of hiking in the mountains and would like that elevation data to better calculate my calories. Overall, I like the look and functions. It’s a great motivator. I upgraded myself from a zip to a flex. I must say that although I am pleased with it’s performance, I would now think twice about recommending one to a friend. I purchased my zip about 6 weeks ago and the band has just broken on me. It’s come away from the seam where it joins onto the main knobbly body bit. Luckily it just decided to ‘let go’ while I was typing an email. Unluckily for me I have misplaced my receipt. … Confident, to the point of cocky, that I wouldn’t have a problem with my Flex. I’ve heard others complain about the band but it wasn’t until I had to part with $45.00 for a replacement 3 pack that I nearly fell over. … I don’t abide well in having to pay 50% of the price of a zip for rubber that should have lasted more than 6 weeks. A quick google has revealed it’s not a rare occurrence. Whilst I don’t have a problem with Fitbit perse – their Flex product line needs a bit of rework. Since the fitbit comes with two bands can two people use one unit? We’ll I love my fitbit flex but it doesn’t love me back. After talking with customer service yet again, I will be on my THIRD flex in less than a year. I wish it would last more than four months per device. 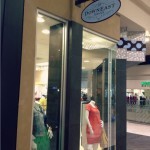 I will say that their customer service is very good and quick to help but I just wish I had something that worked. Purchased my Fitbit Flex in July, 2013. Don’t expect this product to continue working for long. Within a few months light indicator stopped working. Contacted Fitbit and they replaced the Flex. Just in the last few weeks the same thing with the replacement. Will not charge and when it is charged only lasts a few hours. I walk with 3 other people weekly and two of the ladies Flex’s have stopped working. So in less than 9 months they need replacement. For $100 this monitor is a piece of “crap”. Good concept but needs to continue working for 9 months+. Manufacturer needs to engineer this to last. Look for something else. 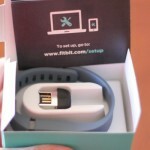 I just purchased my Fitbit Flex over the weekend and hopefully it will be arriving this week! I am SO excited to use it because I’ve heard great things. Also, as far as looks go…Tory Burch is teaming up with Fitbit Flex to create jewelry that will hold the tracker so that you can wear it with your more stylish outfits. I am SO SO SO excited for that! I just found your website while specifically looking for a good review of the fitbit flex. 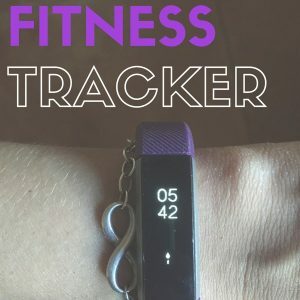 I’m a nurse and am on my feet ALL DAY so I’ve been looking for a good activity tracker. Thanks for all of the great info. I will be purchasing one today and will definitely be following your blog from now on. I am hoping to find out if anyone else has had issues with their fitbit not charging. I received mine for Christmas and have been wearing it religiously. I have two chargers and have tried them both leading me to believe the battery is no longer charging. I spoke to another person who saw my fitbit a few weeks back and said she had this same issue. I don’t see any way to change a battery. Will I need to spend $100 to replace it? I like it for all of the resins people have mentioned and am feeling lost without it. If I am needing to get a new tracker I am considering upgrading. I’ve had mine for two months and absolutely love it. BUT, it will only charge for a few hours now. I really miss it and don’t look forward to going thru the Target extended warranty process. If I get a replacement I probably will consider putting it on my bra when I dress up. It does look a little odd on the same wrist as my watch. 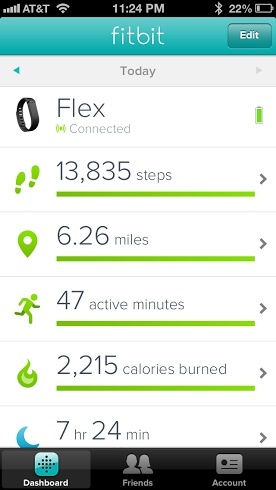 I had (and I say had) a Fitbit Flex for 5 weeks. I loved it and used it while swimming and in the shower. During the five weeks I lost it 3 times because the clasp is not very tight. Needless to say the third time I lost it and could not retrieve it from the lake where we were boating. The other thing I discovered is that it did not track my activity during my spin class – I guess because my arm doesn’t do much in that class. I was going to try the bigger band the next class and put it on my ankle, but then I lost it. I really miss it but will probably not spend the money for another one. I received my Flex two days ago, and while I am really happy with most of the product’s functionality, its appearance is changing. The edging is fading away, or turning black. Against the teal band that I ordered, I’d say it looks a year old already. I work in a professional office, and hate wearing something that looks tatty; in two days I’m a bit frustrated with how it looks. I’ve been wearing it normally, with a blazer and jumper, regular walking and showers, nothing rough at all. I hope there is something that can be done to remedy this, or else I’d probably return the product. Choosing to wear a device 24/7 was a huge commitment for me, and is won’t wear something that doesn’t look presentable. The teal band is actually cool, very modern and looks like a comfortable bangle. In two days, it’s taught me to get out after work and take a walk by myself. Pretty good advice from a bracelet. I love my Fitbit Flex! The only time I do not wear it is when I go swimming or in the shower. I wore it showering one time and had to restart it as it quit running. The reset was easy though; just plug it into the charger, take a small paper clip or pin and push it into the small reset hole on the back of the charger. Because I use an elliptical machine and the treadmill I place the data recorder in my bra so it will record my steps and active minutes. I have wondered about my sleep patterns but the Flex has laid that to rest, pun intended! I know I dream and understand that just because it shows I am restless, doesn’t mean I am not sleeping, just not deep sleeping. I average between 3.5 to 5 hours of good sleep per night the rest is restless with about 3 awake periods. I consider that good in an eight hour night. Never am tired during the day. I would buy another one again. Etsy has tons of accessories to dress up your fitbit. It also has some great gadgets for swimming and attaching your fitbit flex to your bra. I found a great new product on Etsy.com called a Fitbit Strap Wrap, made to wear your Fitbit flex on your bra strap or t-shirt strap. It works great! I never really liked the wrist holder. I have the Fitbit One & it was tracking my steps at a slow pace vs. my friends that have the flex. So I now where it on my wrist & my arepa almost doubled!! So I am Leary of the accuracy of it when it counts my brushing.teeth hair or dogs as steps ! But now I get my 10k steps n 2x a week!